It’s hard enough to start a photography business and have it succeed, it’s even harder a prospect to move that business to a new city, state, or country! 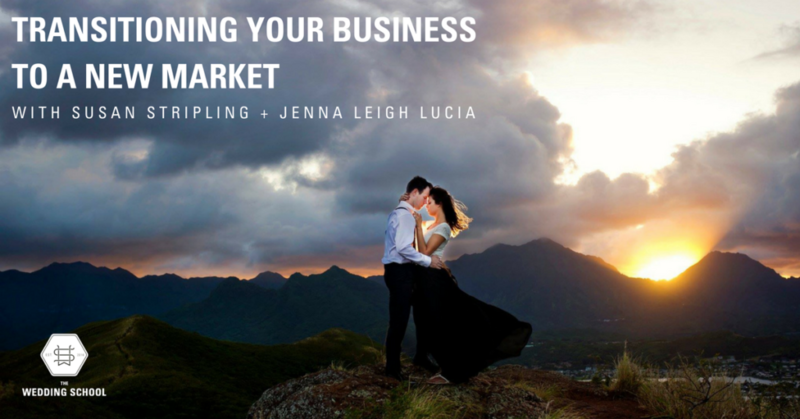 On March 20th, 2018 at 2:00pm EST we will be having a live class with the extraordinary Jenna Leigh Lucia on Transitioning Your Photography Business to a New Market. Jenna recently moved her busy, in-demand wedding photography business from Hawaii to the Washington DC area. Without missing a beat, she’s got a full wedding season in her new home. How? (Trust me, we wanted to know how!) Jenna will cover everything that she has done to ensure that this move is a swimming success, from marketing to business, client care and more. As an added bonus, Susan Stripling will be giving an encore of her WPPI 2018 talk right after Jenna’s live class is over! This talk, entitled How to Differentiate Yourself From Your Competition, is the perfect companion class to Jenna’s Transitioning Your Photography Business to a New Market class! Don’t forget to join us on Tuesday, March 20th at 2pm EST for these two classes! If you’re a Wedding School member, you’ll be able to watch these classes any time after the 20th on demand in the Learning Library. We look forward to seeing you LIVE on the 20th!